CNN’s POLITICAL GUT CHECK | for July 7, 2014 | 5 p.m.
COCHRAN CHALLENGER BUILDING EVIDENCE TOWARDS LEGAL ACTION AGAINST MISSISSIPPI GOP RUNOFF RESULTS: The campaign of the tea party-backed challenger who narrowly lost a Republican primary runoff in Mississippi to longtime Sen. Thad Cochran said it's building the evidence needed to legally contest those results. 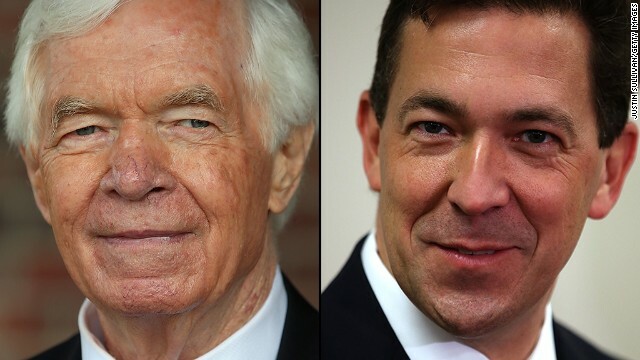 "The evidence we have found so far, which will in part serve as the basis for a challenge, is promising," Noel Fritsch, spokesman for state Sen. Chris McDaniel, told CNN Monday. Fritsch spoke to CNN as attorneys for the campaign told reporters at a news conference at the Hinds County courthouse in Jackson, Mississippi that they will go through ballot boxes, including absentees, before taking legal action. PALIN ON CLINTON: I APPRECIATE HER ‘BOLDNESS’ ...Former Alaska Gov. Sarah Palin praised Hillary Clinton for recounting in her memoir her decision not to attack Palin in 2008 when Republican Sen. John McCain chose the conservative firebrand as his running mate. Palin said in an interview with the Hollywood Reporter published Monday that she "appreciated (Clinton's) boldness" in detailing in her book "Hard Choices" her refusal to follow the Obama campaign's playbook on slamming Palin on the Republican ticket. OBAMA IN TEXAS: AWKWARD IMMIGRATION OPTICS: President Obama is heading to Texas this week, but so far has no plans to visit the border. Homeland Security Secretary Jeh Johnson, however, is going to the border, and is also traveling to Guatemala later in the week to address the crisis posed by the recent influx of undocumented children. The administration is facing growing criticism on both sides of the aisle for failing to adequately address the problem. As noted Monday on CNN’s Inside Politics Obama faces some awkward optics if he ultimately decides to visit the border. Does he meet with undocumented children and upset both conservatives and some law enforcement officials? Does he meet with law enforcement officials and risk angering immigration reform activists in the Democratic base? MARKET WATCH: U.S. stocks end lower, but the Dow managed to stay above 17,000 amid talk of coming rate hikes. S&P 500 falls 0.4%. Who was the first president heard live on the radio? POPE FRANCIS IN A STATEMENT FROM THE VATICAN: “Before God and his people I express my sorrow for the sins and grave crimes of clerical sexual abuse committed against you. And I humbly ask forgiveness ... Sins of clerical sexual abuse against minors have a toxic effect on faith and hope in God." REP. HENRY CUELLAR, D-TEXAS, TO CNN’S CANDY CROWLEY SUNDAY: “The administration is "on step behind ... They should have seen this a long time ago, because we saw those numbers increasing,"
Rockets in the air over Israel means... time for John Kerry to insist peace talks aren't really dead again. The new @CharlieCrist ad is like Chris Brown asking Rihanna for just one more date. President Warren G. Harding was the first president to be heard live via radio. Harding’s voice was heard during a 1922 ceremony in Baltimore remembering "Star Spangled Banner" composer Francis Scott Key. In 1924, the year after Harding’s death, Calvin Coolidge became the first president to make a radio address to the American people from the White House. Congrats to Rob Lockwood (@RobLockwood) and Will McAvoy (@WillMcAvoyACN) for correctly answering today’s Gut Check trivia question. I find it almost hysterically funny that the party that has had "limiting frivolous lawsuits" as a goal to fix almost everything for the past umpteen years has decided that the best way for them to deal with a President trying to do his job is.... a frivolous lawsuit. Whoever said "you can't fix stupid" certainly nailed it when they applied it to Boehner and the House GOP! Showing @RepMarkMeadows the ap "Red Alert Israel" – which alerts every time a rocket or missile is fired at Israel"
Do they have an app for every time an Israeli settlement encroaches further into Gaza in the name of Israeli "manifest destiny"? Republican spokesperson and draft dodger, Ted "Crappy Pants" Nugent needs to get down to Mississippi and fix it so black people cannot vote in a primary. Ted exemplifies republican values. yes, we know, the left thinks trampling the constitution and our rights to be represented in congress are all trivial and frivolous when compared to the rights of your leftist dictator in the whitehouse that thinks his pen is all that is needed to govern the country. isn't that what we fought the revolutionary war for? to do away with kings? "I find it almost hysterically funny that the party that has had "limiting frivolous lawsuits" as a goal to fix almost everything for the past umpteen years has decided that the best way for them to deal with a President trying to do his job is.... a frivolous lawsuit." No lawsuit is frivolous when the SCOTUS is ideologically predisposed to arrive at decisions beneficial to you while ignoring or contravening even its own precedent...in less than a week of setting it. Yes, you read that correctly. The conservatives on the SCOTUS have already contravened their own precedent from the Hobby Lobby case by issuing a stay with respect to the Wheaton College case...all because there are 5 old white male Catholics on the bench who decide the case based on what they want and then basically square-peg-round-hole the decision afterwards. Obama is headed to Texas for campaign fund raisers and NOT because of the disaster HE created. The last thin ghe will ever do is take credit for his disasters and there are many of them to take credit for. We never, EVER had this many juveniles and unattended kids storming the border until the lawless dictator in the White House started using his pen to circumvent the immigration laws. Sniffit – ""Right now, we have found we have found more than 5,000 irregularities. " Correct me if I am wrong Sniffit, but wasn't there a story a while ago about 'hundreds of voter fraud' cases that happened to be caused by homonymy + haste of 'proving your point without checking facts first'? @Tampa Tim-18,000-19,000 of those deaths are self-inflicted and have nothing to do with gun violence or gun laws. Nice red herring.smh. When will Rick Perry come out of the Log Cabin and talk about Hoppy Lobby ? Explore the life of pianist Liberace through the ears of Rick Perry . Really can't wait to see Thad Cochran,Kevin McCarthy,Tom Tillis,Sheldon Adelson,Rupert Mourdoch,Karl Rove,Lindsey Graham,John McCain,Susan Collins,Hayley Barbour,Grover Norquist and the GOP stuff Jeb Bush down the tea party's throats EXACTLY like they stuffed Romney down. Straight no chaser. Hillary will drink to that! GOP is pretty much dead. Tampa also neglects to mention that Chicago makes up over 2.5% of the gun deaths yet has far less than 1% of the population with his comment about asking about the other 31k deaths. Remarkable.